During the 1920s and ’30s, pioneering aviators like Charles Lindbergh and Claude Ryan helped create and secure San Diego’s future as a military and defense center. Following the Second World War, the city saw its geography and climate as a magnet for growth. A bond issue to develop Mission Bay was approved. Two years later, the San Diego Aquaduct opened, bringing Colorado River water here. By 1950, population stood at 555,000 persons. The Fifties saw a doubling of the population and the growth of new communities. In 1958, Interstate 8 opened the Mission Valley to development. In quick order, shopping centers, hotels and a stadium were built. SeaWorld opened near Mission Bay in 1964. San Diego County is the southern most county in California, encompassing an area about the size of the state of Connecticut. By its 100th birthday, San Diego had become California’s third major (and best looking) city. Civic leaders then began redeveloping downtown, managing infrastructure and ensuring that tourism and white-collar businesses would keep the region from recession. These last 40 years have seen marked shifts to enhance entrepreneurship through technology, education, housing and transportation. As “America’s Finest City” plans for its sesquicentennial in 2017, it seeks a city where smart growth accommodates its burgeoning population. 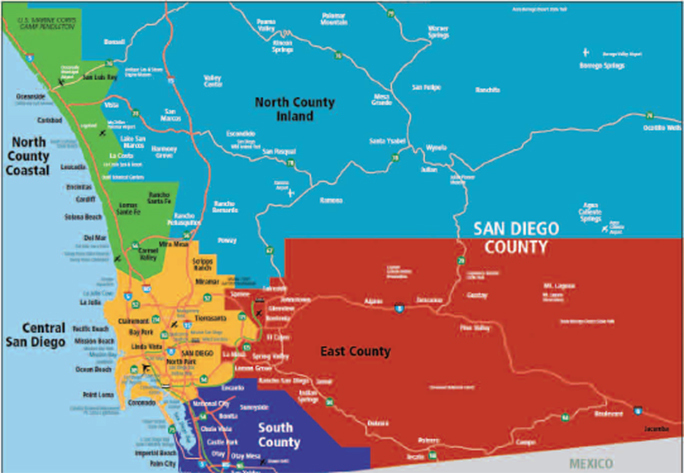 San Diego County is the southernmost county in California, encompassing an area about the size of the state of Connecticut. Three million people live here with one-quarter of the people under 20 years of age and another million ages 25 to 44. The median age is 35.6. San Diego County is comprised of 18 incorporated cities—the largest of which is the City of San Diego. Five elected supervisors govern the County with an administrative officer appointed by the Board of Supervisors. The City of San Diego is the eighth largest city in the nation. San Diego is an ethnically diverse group: 45% White, 29% Hispanic, 16% Asian and 7% Black. Average annual pay is over $60,000 or about 6% higher than the U.S. average. Thirty-five percent of the workforce aged 25+ has a bachelor’s degree or higher. Median household income is $64,273. Over 202,000 households earn more than $75,000/yr. There are nearly 7,000 miles of roads, including three interstate freeways that traverse the county. San Diego’s airport is located three miles from downtown and within a mile of beautiful San Diego Bay—one of the world’s largest natural deep-water harbors. The city has shown tremendous growth in the past fifty years and is gearing up for an estimated influx of one million persons in the next thirty years. Local civic leaders and government officials are committed to creating a larger city without losing the quality of life that draws people here. On the boards are plans to extend the bay front for tourism throughout the South Bay and into the North Embarcadero; modernizing the airport; building a new football stadium; redeveloping the Navy Broadway complex; and creating a series of people-oriented villages based more on walk-around pedestrian traffic rather than cars. As in the other regions of Southern California, The San Diego real estate market is being slowly nursed back to health by low interest rates, a modestly improved economy, and a widening perception that the housing sector is at or near bottom. The median price of a single-family home in San Diego County varies from under $300,000 in areas such as City Heights, Escondido and Oceanside, to $1.3 million in high-end areas such as La Jolla, Coronado and Del Mar. The highest median price, approximately $2 million, is in Rancho Santa Fe. Condo prices vary widely also from a median of under $100,000 to as high as $1 million. Buyers will be pleased to know that real estate and economy experts have noted that San Diego County suffered the least job loss during the recent recession. They also predict that San Diego will be a leader in the nation and the state due to its innovative fields such as high-tech and bio-tech. 2,200 jobs are being added each month and one of the strongest sectors is healthcare, with a demand for medical personnel, construction of new facilities, retrofitting older hospitals, software for information systems, and administration personnel. San Diego weather is normally split into four separate zones: coastal, inland, mountains and desert. Coastal climes are temperate with morning marine layers. Inland temperatures are usually 10 to 20 degrees higher with desert temperatures as much as 30 degrees higher than the coast. Mountain temperatures are warm in the day and cool at night. Average Rainfall per year is approximately 10 inches. As one of America’s most beautiful cities, the challenge for city leaders is making sure it stays that way. One key is bringing in the right kind of business. It’s fair to say that working here—and living here—is being seen as a reward in itself. 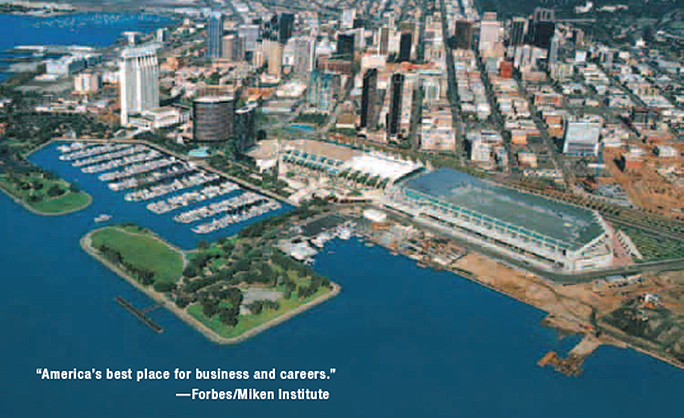 San Diego has become an educated, white-collar town and a model for the “New Economy” with its 150,000 jobs in the high-tech, defense, bio-tech, bio-med, computer software and telecommunications industries. San Diego is a forward-thinking city willing to invest in its future for the sake of its citizens. Support the military and its $24 billion local impact? Yes, for six decades. Vote to keep transit occupancy taxes lower than other tourist and convention locales? Passed. Invest $7 billion for an upgraded trolley, bus and interstate highways transportation network? Passed. Invest $3 billion in a stem cell research initiative? Passed. Build a $460 million dollar ballpark and ignite $3 billion in Downtown investment? Done. Approximately 30 million visitors, of which 15 million are overnighters, visit San Diego annually. That’s 80,000 persons every day of the year! Those visitors spend more than $15 billion locally. Thus, the visitor industry is the third largest revenue generator of our economy behind manufacturing and the military. Over 600,000 individuals attend 70 or more conventions and trade shows each year. There are more than 51,000 hotel and motel rooms available to visitors. Annually, more than 17 million visitors use the San Diego International Airport (Lindbergh Field) and nearly 55 million border crossings are made each year between Mexico and the U.S. via the Otay Mesa and San Ysidro crossings. San Diego is an expensive place to live. The median sale price of single family homes has a broad range, from $200,000 to $2 million, depending on the location within the county. Many residents see their mortgage like an IRA or an annuity. They pay into it for years. Then, one day, they wake up and realize their equity is enormous. The region’s beauty and diversity is an everyday reward for relocation here. Yes, the ante-in is high. But, there’s a mad ecstasy about wearing shorts year round. Move here. You’ll stay for life. Welcome to the coast! It’s what makes San Diego such a world-class destination. With 70 miles of coastline, about a dozen communities work their way up from the border to Camp Pendleton west of Interstate 5. The coast is where California cool began. From its breaking waves, it speaks to all that is primordial yet hip and trendy. The Pacific Ocean. The cliffs. Ocean and bay view homes. Fabulous sunsets. World-class surfers and triathletes. The world’s most beautiful women. And the world’s most concentrated city of scientists and doctors. Metropolitan San Diego is the heart of the County with over 40% of its population and the bulk of its history, tradition and culture. There are dozens of different communities and peoples who live here and give the city its distinctive blend of culture, art, food and style. For example, let’s drive El Cajon Boulevard, a key east-west 50-block thoroughfare. Prior to 1960, “The Boulevard” was the essence of San Diego, its main drag, a place to see and be seen. Today you’ll witness Black, Hispanic, Vietnamese and Jamaican markets, bodegas, restaurants, and churches amid the continuing evolution of the city. Here is where the American Dream of a better life is reborn daily. Then, look around and you’re at San Diego State University, where thousands of collegians walk and live. The Boulevard is revitalized again! And continuing east, into the decades-old, family businesses of La Mesa, one of San Diego’s highest appreciating neighborhoods. This 20 minute car trip tells a story of the history of our town—its past and its future. The ongoing change of this great boulevard over a lifetime creates a wonderful pencil drawing on this canvas of America’s Finest City. Home to the historic Hotel del Coronado (think Marilyn Monroe in Some Like It Hot) and the Naval Air Station, Coronado Island is a town with both history and character. Thousands of luxurious condos and massive two-story homes dot this privileged community. Its low crime rate and top-ranked school district are just two reasons why professional families move here. And popping over the Coronado Bridge and working Downtown takes just five minutes. One of San Diego’s original neighborhoods, the Point is known for its fabulous city, bay and ocean views. The Cabrillo National Monument and Fort Rosecrans National Cemetery celebrate both the birth of our city and the thousands who have fallen defending it. Neighborhoods range from single family homes to elegant Spanish style casas. The San Diego Yacht Club has trained thousands of young sailors (including four time America’s Cup winner Dennis Conner) and Point Loma Nazarene College teaches thousands of young people each year from its ocean view campus. One of San Diego’s premier ocean view communities, Ocean Beach is known for its row of antique stores, breakfast restaurants and a quarter mile long fishing pier where surfers and fishermen meet. The community has a decades long history as one of San Diego’s most colorful, character-filled beach towns. Many of the houses here are built on hills and offer whitewater and mountain views. Just up the hill from Interstate 5, east of Sea World, sits Bay Park. With its cul-de-sacs, vistas and views of Mission Bay, this tightly knit community retains much of its historical ethnic flavor. Adjacent to the University of San Diego and blessed with both churches and parochial schools, Bay Park is upper middle class yet very down-to-earth. Just north of where the San Diego River empties into the ocean, Mission Beach epitomizes California cool—a place where world-class volleyball players and surfers mingle at water’s edge. Mission Beach and the adjacent Mission Bay feature a mix of condos, single-family houses and vacation rentals. It is truly a young professional’s paradise where fitness rules. With its well-kept bungalows and thousands of condos and rental units, Pacific Beach is where the surf meets the graduates. Pacific Beach engulfs an eclectic mix of nightspots, restaurants and mom and pop shops where empty nesters and singles congregate. At the southern end stands Crown Point, an idyllic neighborhood that surrounds tranquil Mission Bay. Crown Point has both condos and homes and attracts a lively seniors market. stores, art galleries, restaurants and hotels, many with stunning ocean views. In addition to serving as a finance center, the North Torrey Pines area is home to the prestigious Salk Institute, Scripps Hospital and the University of California at San Diego. San Diego’s dynamic Downtown includes eight separate neighbor-hoods spread over 1,500 acres. Currently, 28,000 persons live downtown. 50,000 more are expected in the next two decades. New housing stock is being built to provide a wide array of options for persons of all income levels. Here, you’ll find single room occupancy buildings (SROs), lofts, two-bedroom units and multi-million dollar ocean-view condos. This new housing is being balanced with new infrastructure, amenities and job creation. This key commercial downtown neighborhood includes: Broadway Pier; the waterfront; federal and county courthouses; the cruise ship terminal; the Museum of Contemporary Art, the historic Santa Fe Depot train station, and the award-winning Anthology Nightclub. Seven luxury high-rise office and residential buildings are located on or near historic Pacific Hwy just west of Broadway. The physical center and financial hub of the city, the Core features high-line hotels, Horton Plaza Shopping Center, the City Concourse, and the Civic Theatre. Downtown’s tallest building, Symphony Tower, is located here and is home of San Diego’s premier University Club. famed El Cortez Hotel offered enticing views from the Pacific Ocean to Balboa Park to the San Diego Bay. Today, 275 new condos and 400 apartments are now completed—many which offer panoramic views. East Village is the County’s most rapidly developing neighborhood. Anchored by Petco Park, this formerly blighted area is being transformed into a vibrant community. Nearly 2,500 condos and 1,300 apartment units are located here. East Village is the home of the Park to Bay Link, where a promenade is being created from Twelfth Avenue to Park Boulevard. A new Main Library will be placed along this paseo linking the historic park and world-famous Zoo to the Embarcadero. San Diego began here in the 1870s. Today, it’s the hottest restaurant and nightlife section in town. This historic neighborhood has several mixed-use, low-slung sites offering over 400 condos and apartments, as well as a new Hard Rock Hotel at the ceremonial Fifth Avenue entrance to the city hub. This 15-block area is where redevelopment began two decades ago. There are limited condos and apartments available at the center of the stunning shopping center and all its activity. Comparable to Mulberry Street in NYC or North Beach in San Francisco, this neighborhood originally was home to our tuna fishing industry and its workers. Today, revitalized India Street and its quaint Italian restaurants are surrounded by a dozen new, small-unit condos, town houses and apartment buildings. After an espresso, walk two blocks to the bay and you’re staring at the world-famous 140 year-old clipper ship Star of India. Perhaps Downtown’s most beautiful and desirable neighborhood, the Marina, is close to San Diego Bay, the Embarcadero, several waterfront hotels, the boardwalk, Seaport Village, and the Convention Center. Here you’ll find luxury high-rise and mid-rise condos. The North Embarcadero Visionary Plan, which will include a grand entrance along Broadway, a 1.2 mile boardwalk along the waterfront, a revitalization of the Broadway Pier, and a Park-to-Bay linkage, will transform our “front porch” into a jewel of mixed-use coastal living by 2020. Seven neighborhoods comprise Southeast San Diego and its melting pot populace. Bordered by I-5, Hwy 94, National City and Lemon Grove, here you’ll find the rundown and the spruced up. There are dozens of different churches, mom and pop storefronts, and great ethnic food on the street. Home prices are among the most affordable in the County and just minutes from Downtown. Mission Hills is a beautiful neighborhood overlooking Down-ztown and the ocean with craftsman-style homes and lush canyons. Below lies Old Town, known as the birthplace of the city’s Mexican heritage. Homes easily run in the $1 million+ range. Just east of Downtown is Balboa Park, the Zoo and the charming neighborhoods of Golden Hill and North Park. 1920’s style Spanish haciendas thrive here. In Hillcrest, pedestrians stroll down the streets. And just south are the beautiful Victorian neighborhoods of Banker’s Hill and Mission Hills. There are many fine Victorian and Spanish homes as well as rental homes and condos. Hillcrest is the gay and lesbian center of San Diego. These beautiful mid-city commun-ities feature canyons, Spanish style homes and terrific atmosphere. Seventy year old houses feature lathe and plaster craftsmanship and design flourishes. San Diego State University is just a few miles west while Mission Valley and Downtown are about ten minutes away via the freeway. Here is one of San Diego’s Pacific Islander and Asian communities. With its great ethnic restaurants and small retail shops, Linda Vista takes you straight to the entrances of Mesa College, the prestigious Francis Parker Middle/High School, and the magnificent and historic University of San Diego campus. Homes are more affordable here and the neighborhood is within minutes of all major job and commercial centers. Just five minutes north from Downtown on beautiful Highway 163 lies the Mission Valley. As recent as 50 years ago, it was a two-lane road going east and west through pastures. Today, it is home to: thousands of condos, apartments and hotel rooms; three major shopping centers (with 46 movie screens! ); a football stadium; a golf course; a dozen car dealers; and the San Diego River in the middle of it all. This middle-class community of tract homes is just north of Interstate 8—a hop away from both the football stadium and San Diego State University. Here you’ll find ranches, cottages and bungalows often with that tight knit neighborhood feel. San Carlos features large homes overlooking Lake Murray. Like La Mesa on the other side of the freeway, it has a “just folks” appeal where residents care enough to take care of their own. Here is an area where family, school and church reign. Burgeoning San Diego State University has helped maintain this community’s luster. Here, you’ll find apartments, condos and smaller, tract houses populated by both the young and old. Many parents have bought homes and condos here for their children attending the university. This upsurge has allowed empty nesters to refurbish their properties via increased equity. San Diego’s first master planned community is known as the “Island in the Hills.” Surrounded by Murphy Canyon, the Mission Trails Regional Park and two interstate highways, Tierrasanta features thousands of townhouses, condos and detached homes for families, singles and empty nesters. The “Tierrafest,” held each Spring, is a day-long celebration that unites this bedroom community. Clairemont is located just East of Interstate 5 near Mission Bay Park and stretches inland. The area is known as middle class, family-friendly and affordable. In the South Clairemont area, hundreds of hillside houses have incredible views of Mission Bay, the Tecolote Golf Course or the Tecolote Canyon. SeaWorld and the University of San Diego are just five minutes away. University City acts as the County’s second business center. Dozens of high rise office buildings wind east on La Jolla Village Drive from Interstate 5 toward Interstate 805. Thousands of condos, townhouses and detached houses surround the hub and serve a decidedly upscale populace. Two miles north, hundreds of doctors serve the community at large. 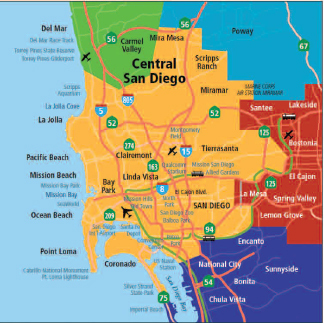 Mira Mesa is a melting pot community smack dab in the middle of the County with a large military and Asian population, excellent Oriental restaurants, a great ice hockey rink, a cool hangout called The Epicenter, and Miramar College. It is comprised of dense tract housing built primarily for young first time buyers. To the west is Sorrento Mesa, featuring newer homes perched above the Peñasquitos preserve with easy access to Sorrento Valley’s high tech center. Scripps Ranch is known for pastoral living under a canopy of eucalyptus trees bordering beautiful Lake Miramar. It is a popular community for young professional families. A series of low-slung office business parks complete this picturesque area. Is the coastal North County the best thirty mile stretch of California? Surely, it ranks up there with Laguna Beach and Carmel. 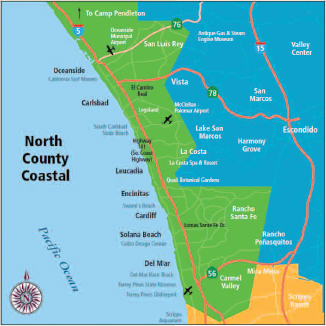 Breathtaking ocean views, million dollar homes, miles of parks and trails, pristine beaches—this is what makes North County so special. Let’s take the coast road north from the La Jolla Shores. On your left, you’ll pass the Scripps Aquarium, the Salk Institute, UCSD and the Torrey Pines State Preserve. As you drive on North Torrey Pines Road, you’ll pass the stunning golf course, Scripps Hospital and many of the world’s key biotech companies. You’ll drive down a mile long decline and meet the whitewater ocean. Within a few blocks, you’ll enter the City of Del Mar with its architecturally diverse homes, chic shops, boutique hotels and eclectic eateries. Continue on and you’ll see the Del Mar Race Track, considered one of America’s best thoroughbred horse racing venues. Five minutes later, you’ll come upon the Cedros Design Center in Solana Beach. Boutiques with cool furniture, clothing and furnishing stores cover this mile-long stretch. Drive east on Lomas Santa Fe Drive and you’ll be in historic ranch country, Rancho Santa Fe, within a few minutes. Continuing north on Hwy 101, you’ll find a great mix of the chic, the funky, and the upscale. In Cardiff, you’ll be reminded of California Dreamin’, a place where residents prize their pristine beaches and surf hangouts. In Encinitas and Leucadia, you’ll feel like you are back in the sixties with small shops, restaurants, nurseries, and orchid farms, as well as an eclectic community of homes in harmony with the ocean lifestyle. Further up the road in Carlsbad are quaint bed and breakfast hotels alongside flower fields. In Oceanside, this military town is being transformed by new homes and businesses. Are these the best thirty miles in California? Drive it and see! Carmel Valley is actually a conglomeration of communities that juxtapose high-end tract homes with multi-million dollar estates and the only five-star resort in San Diego County, The Grand Del Mar. The public schools are consistently among the highest rated in the County, the crime rate is low, and family-oriented neighborhoods and activities are the norm. Located East of Interstate 5 and a short drive from the beach, Carmel Valley offers sunny days with cool ocean breezes. Over 11,000 homes and 5,000 condos dot this new community. Designed for busy families, the lots are smaller and the homes are larger. Carmel Valley, the hub of international law firms, is also adjacent to Sorrento Valley, the key bio-tech and telecom job center in America. Del Mar, “where the surf meets the turf,” is a chic beach town that is home to the Del Mar Racetrack and San Diego County Fair. Located north of La Jolla and adjacent to Torrey Pines State Beach, this quaint village features boutique shopping and many of the County’s finest restaurants. Residents love the architecturally inspired housing as well as the fresh air and spectacular views afforded by proximity to the ocean. Families are attracted to Del Mar because of the high-ranking public schools, great beaches, summer concerts “by the sea,” and walks on Dog Beach. Del Mar draws successful, accomplished people; in a population of 5,000, at least half are college graduates. Solana (“Sunny”) Beach is located north of Del Mar and south of the San Elijo Lagoon and Ecological Reserve. In addition to pristine beaches, Solana Beach offers Cedros Avenue, a mecca of designer shops, art galleries, artisan workshops, yoga and exercise studios, day spas and casual eating spots. Hundreds of rock and blues acts perform each year at the world-famous, 600-seat Belly Up Tavern. The train stops in Solana Beach, where travelers can stroll down the coastal rail trail or meander through the authentic Farmer’s Market on Sundays. Over 6,000 homes are built on the slopes (many with ocean views) and parents appreciate the superior quality of the local public and private schools. The greater Rancho Santa Fe area, adjacent to the coastal towns of Del Mar, Solana Beach and Encinitas, is comprised of 4,000 households within a variety of communities. One is nestled amidst lemon groves. Another caters to seniors and empty nesters. Yet another features Tuscan architecture and suspended bridges. Many are gated. At the core of America’s richest town is the Rancho Santa Fe Covenant, a historical community abundant with eucalyptus trees, winding roads and horse trails, community-centered activities and superior schools. The median price of homes here is the highest in the county. Six exclusive private country clubs are located here. Adjacent to Rancho Santa Fe, Santaluz was designed as a rustic village featuring a natural, native California landscape. More than 900 home sites are circular and sculpted to blend with the hillsides, ridges and ravines that make up the San Dieguito River Valley. This gated community also features a 250-acre Rees Jones golf course. Its low density (one home per four acres), inclusion in the highly regarded Poway school district, the charming Golf Course, Spa, and 11-acre Village Green at its center have made this both an elegant and family-oriented community. Encinitas is divided into five areas, four of which are beach towns that have retained their charm and simplicity. Bordered by two lagoons and known as the “Flower Capital of the World,” Encinitas is one of the world’s major suppliers of poinsettias. Old Encinitas is beachside, while inland New Encinitas features golf courses, shopping centers and larger tract homes. There is a mix of businesses and a wide variety of housing styles in Encinitas Proper, but they all feature the laid-back lifestyle that you will witness when you walk down the main street of town. Moonlight Beach, with its sand volleyball and firepits, is a classic symbol of the Encinitas way of life. At the South end of Encinitas is Cardiff-By-The-Sea, where the sprawling grounds of the Self-Realization Fellowship are perched above the beaches below where residents walk, surf, and swim daily. Streets are named after British cities and classical composers. People move here because they crave a simpler lifestyle, one in which they can be in touch with Nature and buy groceries in their neighborhood store where they can find locally grown produce. Leucadia, which means Isle of Paradise, is a quiet surfing town, reminiscent of California beach villages of the past. It is located in the north coastal part of Encinitas, just south of Carlsbad. People who live in Leucadia have a strong independent character and a lot of pride in their community. Inland Olivenhain (German for “olive grove”) is semi-rural and country living at its best, offering estate homes on large lots, ideal for gardening, peaceful reflection, and horse-keeping, yet still close to shopping and restaurants. There is a very active 4-H Club. Known as “the village by the sea,” picturesque Carlsbad has a historic downtown district overlooking the ocean. As the town stretches east toward Palomar Airport, golfing manufacturers, corporate offices and biotech parks mesh with the Legoland theme park. Further south, the La Costa Resort and Spa and the Four Seasons Aviara Resort offer world-class amenities. Within this coastal and inland community, you’ll find families living in upscale and upwardly mobile neighborhoods. There are also a slew of golf courses. Founded in the mid-1880s, the town got its name from spring waters that tasted identical to spa water in Karlsbad, Bohemia. The northernmost city in the County, Oceanside is transforming itself from the backyard of Camp Pendleton’s Marine Corps base into a vibrant business and tourism center. Persons living here can work either in North San Diego or Southern Orange County without long commutes. Oceanside has an affordable supply of new housing and condominium developments, including two retirement commun-ities. The Harbor and Marina is a great place to relax and the 2,000 foot pier is one of the longest wooden piers on the West Coast. Finally, the San Luis Rey Mission has stood for nearly 200 years as a symbol of the Spanish Jesuits who founded the region. Starting with the Miramar Air Base (where the movie Top Gun was filmed), a series of communities have evolved around the I-15 freeway, which extends from the southernmost border of San Diego to Riverside County. From suburban to country, each of these communities has a niche and is often characterized by lakes, groves, golf courses or all three. Rancho Penasquitos, which means “little cliffs” in Spanish, is named after the first Spanish land grant in the county. Family oriented PQ abuts the Los Penasquitos canyon open space preserve with its hiking, biking, and equestrian trails. Rancho Bernardo is a Senior haven and has a 24-hole executive golf course that was voted one of the best in the U.S. Adjacent Poway is horse country, also known for its superior schools. Escondido is an older town that has been revitalized with trendy restaurants and an art enclave. The further north you go, the more rural it becomes, with large ranches in Valley Center that were a natural outgrowth of this town’s two acre minimum lot size. Then there is Fallbrook, the friendly village, also known as the “avocado capital of the world.” Indian land and very successful Indian casinos are found in this northernmost region. Vista has a vastly diverse population with one of Southern California’s only two Japanese American cultural centers, and San Marcos is home to California State University San Marcos and Palomar Community College. Bonsall, once a quiet farming community, has developed into a residential town surrounded by lush foothills, golf courses, farms, and parkland. Into the hills you go, into Ramona and Julian, where snow still falls and autumn is welcomed with the tantalizing aroma of fresh apple pies. Route 78 runs from the I-15 freeway to the I-5 freeway and offers housing starts as well as major retailers. Rancho Peñasquitos is an affordable bedroom community near Interstate 15. Located in the Poway school district, it has three high schools within close proximity and the Penasquitos preserve for horsebackriding, biking, and strolling. Sabre Springs and Carmel Mountain Ranch feature family recreational activities and golf course living at its best. Poway is known for its schools and horse trails. Within this well-planned residential community, you’ll find everything from town-homes to rural estates. Many professional athletes live here. Situated east of Interstate 15, the community is set into the foothills and projects a rural ambience. Since it blends retail centers, business parks and the pastoral experience so well, Poway is a recreational haven for country life. Rancho Bernardo is a master planned mature community known for golf carts and golf courses. It features separate sections for families, executives and retirees. It is also a center for electronics enterprises. Escondido (“Hidden Valley”) has historic charm going back 115 years. Its Grape Day parade is a centennial-old tradition. Just 60 years ago, the community had 5,000 persons—when travel from Downtown would take 2 hours on a two-lane road. Now, Interstate 15 can get you there in 30 minutes. Lake Hodges to the west is a large reservoir with popular bike and hiking trails. There is a unique mix of agriculture, industrial and high tech firms, recreational centers and parks and residential areas here. The California Center for the Arts is a shining cultural icon for art, music and theatre. The 600 acre Welk Resort and Champagne Village, once home to Lawrence Welk, contains upscale timeshares, golf courses, and a theatre that performs live Broadway musicals year round. This largely undeveloped community north of Escondido adjacent to Interstate 15 has lots of acreage and agriculture. Large private ranches and gated communities dot the rolling hills surrounding the old-fashioned downtown. Bates Nut Farm rolls out some of the County’s biggest pumpkins each October. Two large Indian casinos have created new jobs and tourism. Rural estate living and a picturesque downtown are components of Fallbrook life. Avocados flourish in the temperate climate about 20 minutes north of Escondido. Huge stones and boulders abound next to 40 foot palm trees. It’s no wonder that this equestrian community has the Top 4H Club in San Diego County. This equestrian community at the northernmost edge of the County is home to large rolling estates and ranches. Ramona, Santa Ysabel and Julian are three rural towns nested in the hills of North County Inland. Ramona is known for its large eucalyptus trees. Each year, the city hosts the largest non-motorized parade in the country. In Santa Ysabel, Dudley’s Bakery and Tom’s Chicken Shack are must-visits And Julian, a historic gold mining town, is situated about 4,000 feet above sea level. Apple pies, huge pumpkins, charming Bed and Breakfast inns, and Sunday afternoons near Lake Cuyamaca make these three communities a slice of Americana. Vista has earned a reputation as a job hub based on its 15 million square foot business and research park. Rapidly infilling with residential housing, the community offers affordable housing. To the west of Escondido is San Marcos. With its resort climate, central North County location and rural setting, San Marcos provides an affordable setting with some room to move. The city is home to two of the region’s major educational facilities. Lake San Marcos is a beautiful lake surrounded by high hills. This is so true. With its lakes, mountains and spectacular changes-of-season, a typical garage will sport a pick-up truck, an SUV, a boat, two bikes and a dune buggy. Here, you’ll find mountaintops with endless vistas and regional parks with hundreds of miles of trails. Sovereign Indian tribes have lived here for 10,000 years. And the beauty of the back country can be seen on bike or with pack. Although Interstate 8 starts in Ocean Beach, it weaves east through San Diego, El Centro and into Arizona. 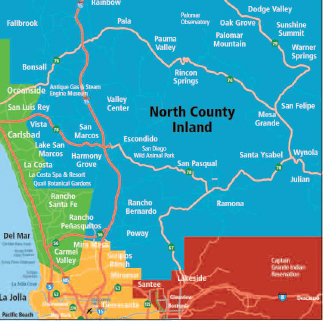 It is the perfect route for seeing East County. Starting in Mission Valley, you’ll venture up the hill into San Diego State University and then down past La Mesa and into the valley of El Cajon. Breathtaking hills surround you. Venture east and you’ll pass Indian casinos and horse country leading past Alpine and up into the pristine mountains, valleys and lakes of Pine Valley. Are we in Oregon? Go north on State Highway 79 and you’ll soon enter a series of serene little mountain towns near Lake Cuyamaca. Somehow, it seems like a drive through Napa wine country. Loop back onto what becomes Highway 67 and you’ll slowly enter civilization again. In Lakeside, country music and cowboy boots rule. And Santee boasts one of the few remaining drive-in movie theatres in the County. What could be more American than three kids in their pj’s watching a Disney movie from the bed of their truck on a Saturday night in July? East County retains an old-style homespun feel under its huge sky. Progress can’t touch it—and that’s why living here is so special. La Mesa is centrally located 12 miles east of Downtown. With its ranch-style homes, mixed-use condos and plentiful hilltop home sites, La Mesa strikes a balance between single and multi-family housing. The La Mesa Village sports dozens of small businesses with a hometown, homestyle feel. The exclusive Mt. Helix area has amazing views stretching 20 miles on a clear day. Twenty years ago, Alpine was the end of the earth. You’d take Interstate 8 East toward the desert and after Alpine there was nothing. Today, Alpine is the site of the Viejas Indian Casino and Resort and boasts an intimate amphitheatre, 2000 slot mach-ines, table games and a great little shopping center. Here in the hills toward the mountains, you’ll find working farms, gentlemen farmers and thirty-mile views to the ocean. It’s rural, it’s rich and it gets a little closer everyday. The communities of Lemon Grove and Spring Valley retain a large-lot rural quality to them while Rancho San Diego hugs the Otay Mesa Lake with a wide array of housing choices. El Cajon, or “The Box,” is just twenty minutes away from Downtown. An inland valley surrounded by rolling hills and mountains, it has a warm and dry climate. Home to three different sections, El Cajon varies from apartments, condos and tract homes to the master planned Rancho San Diego area, where semi-custom homes and three golf courses create hillside and valley splendor. This is truly beautiful country with mesas, hills, valleys, boulders, parkland and lakes. The lots are large, the houses too, and the neighbors like their wide open spaces. Jamul’s got a post office and an elementary/ middle school and some stores and lots of horses. In Dehesa, there’s golf and the nearby Sycuan Casino and Resort. Lakeside and Santee stand at the eastern edge of town and are bordered by slopes, lakes and mountains. The San Diego River runs through the community, which was once a dairy farming area. With its suburban, child-filled neighborhoods, these two communities focus on family. Santee residents can ride the trolley to Mission Valley, Downtown and the Mexican border. South San Diego County has all the ingredients for success. It has nearly half of the remaining business acreage in the County. Multiple public entities are working together to meet the needs of both employers and their workforce via new roads, transit, schools and trade. The result: using smart growth to transform undeveloped mesas into a city within a city. From here, Downtown is just a 20 minute drive away! And, housing costs are far lower than smaller Downtown lofts or similarly sized homes a half hour to the north. Why? It’s new, it’s pioneer country and it’s coming along in stages. But make no mistake—South County is where tomorrow begins today. The Area is split upon Interstate highway lines. Closer to the coast, Interstate 5 links the more established South Bay Communities. Interstate 805 has newer development. On I-5, it’s only 20 miles from Downtown to the Mexican border. Along the way, you’ll drive past manufacturing and shipping yards, tourist and marina sites, and a pristine estuary. You’ll find great mom and pop restaurants serving up Mexican, Filipino, Black and Asian specialties. You’ll see the trolley line sprinting past you. And you’ll be at the San Ysidro border crossing, the world’s busiest, in just twenty minutes. Cross the border into Tijuana and, within 90 minutes, you’re in the sleepy fishing town of Ensenada. But if you take Hwy 905 East before the last U.S. exit, you’ll glide eight miles east into the future. Here, you find dozens of large Japanese corporations who have maquiladora operations just across the second border crossing at Otay Mesa, two minutes north of Rodriguez International Airport. Cross onto Highway 805 going north, and you’ll find new community developments like Otay Ranch and Eastlake plus the Olympic Training Center, a massive Amphitheatre and several new schools. 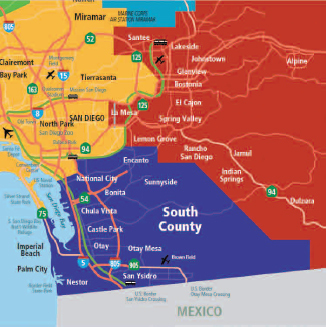 South San Diego County is considered the crossroads of our region’s future. Tailor-made for families, it is where tens of thousands of residents will help shape our city in the next generation. It’s an exciting place to live!! Master-planned communities here are seamlessly blending homes, shops and schools to create neighborhoods with personality. Commuters who work in the South Bay find themselves in the enviable position of going against the grain of traffic both morning and evening. Bordered to the South by Tijuana and the west by the blue Pacific, Imperial Beach is San Diego’s southernmost coastal city. Nestled south of Silver Strand State Park and the city of Coronado, “IB” is quickly becoming more upscale as prospective homeowners realize that it is the County’s least expensive beach community. Thus, many plain-Jane tract homes are getting facelifts and second stories. The town’s annual sand castle competition is a key summer event and there’s a great fishing pier, too. Plus, there’s an estuary nature center and ample park land. This community straddles the last U.S. exit before Tijuana and houses a bi-national citizenry where signs are routinely posted in two languages. Dozens of national name outlet shops line the Mexican border. Chula Vista is a multi-ethnic community that is home to over 40 per cent of all businesses in the South Bay region of San Diego County. Here, Knott’s Soak City and the Coors Amphitheatre entertain thousands of children and adults each summer. The marina and bay front feature fine restaurants. The Olympic Training Center is home to America’s finest athletes. And the community is affordable. Just seven miles south of Downtown and with a large amount of bay front, redevelopment is transforming the area into a more tourist-friendly city. The marina is a wonderful place for boating, recreation and restaurants. Meanwhile, Third Street, the city’s main street, has seen nearly $200 million in new investment. Over 115 years old, the community of Bonita remains the most charming part of the South Bay with its Spanish architecture and upscale homes. What gives Bonita its charm are its Spanish and ranch homes surrounded by 80 year-old eucalyptus and mature palm trees. Also, you’ll find many equestrian properties here. National City is the industrial heart of the South Bay. Manufacturing, shipbuilding and repair businesses employ thousands. The San Diego Naval Station is the largest facility in the country. The county’s largest automotive zone,the Mile of Cars, stretches at least that far and has over 5,000 cars. Hispanics and Asians have created a diversity that is seen in the many businesses and restaurants. Housing is reasonable and plentiful. You’ll find a mix of old and new here. Victorian and Tudor style homes mix freely with Spanish style bungalows. In Paradise Hills, you’ll find ranch homes. And the building of new three and four story office buildings is creating an entrepreneurial revival. Southeast of Chula Vista is the future of the South County. The decade old, 3,000-acre master planned community of EastLake currently houses 30,000 residents. The Spanish design and motif give the area a uniquely Southern California look. The 5,300-acre Otay Ranch, adjacent to the Upper and Lower Otay Lakes, is still in the development stages. TerraNova is an upscale homeowner community with ocean views. Rancho Del Rey is an even newer planned community with condos and homes. Located south of Chula Vista and east of Imperial Beach, these two areas are mostly condos and apartment complexes. In Palm City, you’ll see Victorian homes. In Nestor, you’ll see ranches and dairies. With 93 golf courses in every conceivable setting from mountains to desert to ocean, it’s no wonder Golf Digest named San Diego “one of the Top 50 golf destinations in the world.” Even the Pros agree, with both the 2008 US Open Championship and the PGA Tour’s annual Farmers Insurance Open held at the legendary Torrey Pines golf course. Numerous San Diego courses have also been designed by golf luminaries like Gary Roger Baird, Tom Fazio, Ron Fream, Alister Mackenzie, John Miller, Gary Player, and Ted Robinson. Whether you’re a scratch handicapper or a weekend duffer, you won’t be disappointed in the array of spectacular golf courses here. San Diego is the perfect year-round golf destination and the fastest growing destination for golf in California, if not the fastest growing golf destination in the whole U.S.A. Of course Torrey Pines Golf Course and the La Costa Golf Resort & Spa are the most famous golf courses in San Diego, but the San Diego golf scene has much more to offer beyond those two world-renowned golf courses. With an average annual rainfall of about 5 inches, the San Diego golf climate seasonally ranges in temperature from 60–85 degrees, with 75 degrees being the average. It literally does not rain at all in San Diego for 6–8 months at a stretch. (April–October) Year-round golf weather doesn’t get much better than that! The greens fees to play both the 18-hole and par-3 courses in San Diego are an absolute bargain in comparison to other golf destinations in the country. The quality, variety and design of the layouts are very impressive and offer all types of golf experiences to fit anyone’s budget. This lovely mall is the step-off point to the Coronado-Downtown ferry ride. Featuring Art galleries, specialty stores, fine dining and a Farmer’s Market on Tuesdays. Horton Plaza occupies seven city blocks on seven levels. Its quirky and engaging architectural framework embraces the Downtown skyline. Features 140 shops, restaurants and theatres. One of San Diego’s key tourist hubs, Seaport Village is set alongside San Diego Bay and a wide boardwalk. 75 boutiques, galleries and restaurants, plus an 1890’s carousel are set amid this lovely setting at the Embarcadero. Downtown La Jolla is a scenic shopping district with views of the Pacific Ocean. Here you’ll find international designer boutiques, world class art, renowned hotels and some of the County’s best seafood and continental restaurants. This wildly painted mall in the center of Mission Valley includes a 20-plex theatre, Robinsons–May, Macy’s Furniture and Target. With its mix of stores like Bloomingdales, Tiffany’s, Neiman-Marcus, Nordstrom’s, Bang & Olufson and Brooks Brothers…well, it’s a shopper’s paradise. Also features an 18-screen theatre and huge patio food court. Built by Spanish settlers in 1769, this six block area is the oldest part of San Diego. Visit the Bazaar del Mundo, an open air marketplace withgreat food and colorful wares. This upscale mall is anchored by Nordstrom’s, Sears, Macy’s and Lindbergh Field. www.carlsbadcompanystores.com More than 70 name brand discount outlets are located in this Spanish-style mall next to the Carlsbad Flower Fields. This upscale center features women’s specialty apparel, a wonderful grocery store, and two great restaurants. This massive, two story enclosed mall just off I-15 features over 180 retailers. This enclosed mall is situated in a relaxing park setting. 200 shops are in the mall including an eighteen-screen movie theatre, food court and sitdown restaurants. Regional outdoor mall with 70 stores includes three department stores and dozens of casual dining restaurants. This open air shopping mall in the middle of South County features JC Penney, Sears, Mervyn’s and Macy’s. South County’s largest shopping mall has 140 tenants including several major department stores.